Against a grey ground the actor Arashi Kitsusaburō I as Hyogonokami Yorimasa holding a bow and arrow in the play 'Yorimasa Nue Monogatari' performed at the Hori-e Theatre in 8/1821. It would seem that Arashi Kitsusuaburō I must have been ill during most of the first half of 1821, for there is no mention of any performance between the New Year and this date. The actor began playing this role on the second day of the month, but by the 11th, he had fallen ill again. Makamura Itcho stood in for him, but on the 12th Kitsusaburō could still not continue; he withdrew from the production on the 13th. He rested at the theater until the 19th, returning home by boat that evening. On the morning of the 26th he died. 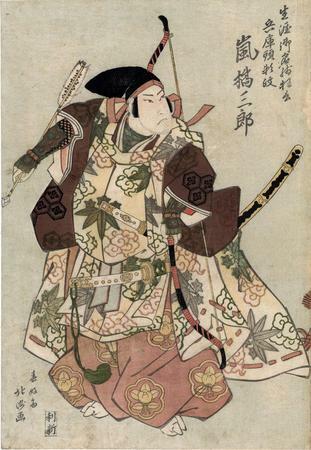 Many of the memorial prints issued following his death portray the actor in this role, including one by Hokushū. This print, however, makes no mention of his death and was probably issued before his illness, unwittingly memorializing the actor's last role. A heavily trimmed example is illustrated in Schwaab Osaka Prints, cat #34 page 77. There are four other prints in the Lyon Collection which deal with the theme of Yorimasa's slaying of the nue: #200, a triptych by Kuniyoshi; #584 by Shunshi; #909 by Kuniyoshi; and #1170 by Ashiyuki. Illustrated in Ikeda Bunko, Kamigata yakusha-e shūsei (Collected Kamigata Actor Prints), vol. 1, Ikeda Bunko Library, Osaka 1997, no. 101. There is another copy of this print in the Nationaal Museum van Wereldculturen, Leiden.